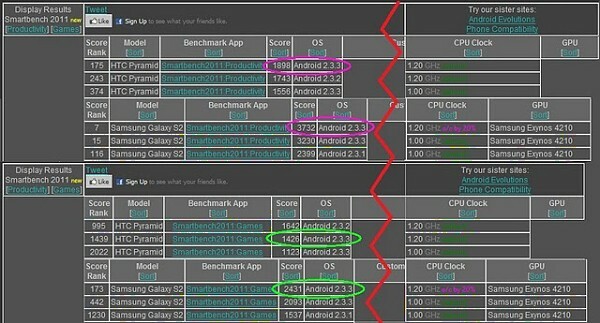 Okay we can’t say we are stunned since the 1GHz Galaxy S II was already blazing fast, but 1.2GHz version benchmark results are still pretty impressive. Obviously Samsung has not only managed to crank the clock speed up a notch, but they have also improved their drivers as the tested unit is 25% faster than the one we had at the office. Apparently in their current states the Samsung I9100 Galaxy S II is about twice as good as the HTC Sensation (or Pyramid if you will) on Smartbench, where it got 3732 in productivity and 2431 in gaming and it even manages to beat it at Quadrant with the astounding 3053 points. 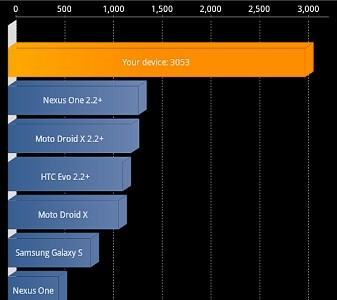 And that’s despite the framerate cap, which doesn’t allow the Galaxy S II to reveal its full potential. Of course that has quite a lot more to do with the Sensation drivers being far from finished then the Galaxy S II being really that much faster. Still it’s yet another confirmation that if you want flawless performance the new Samsung flagship will be more than capable of delivering it.